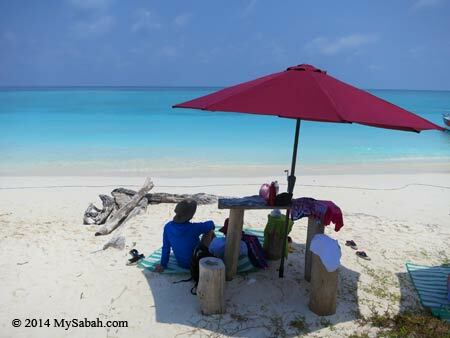 Did you know that Sabah has 392 islands and we are the state having the largest number of islands in Malaysia? I wish I can explore them all, and there is a beautiful but least-known island just 56 KM north-west of Kota Kinabalu City (see Location Map). If you take a flight flying north, you would see this island, Mengalum, which looks like a donut with irregular circle from the sky. 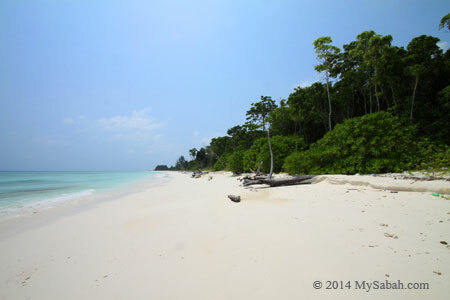 This island is so remote and private that it’s ideal for nudists to go streaking on the beach there lol. I went with WB Tours and Travel (顺顺旅游) for my first visit to Mengalum last month. I departed from Jesselton Point Ferry Terminal with two catamaran fully loaded with 24 China tourists at 8:30am. 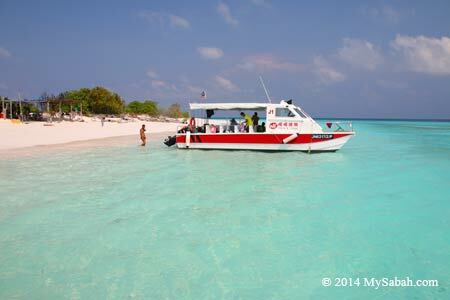 The weather was perfect and our boats cruised smoothly on the calm sea. 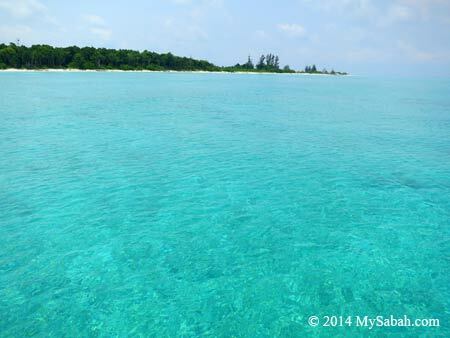 After an hour, the color of seawater turned from navy blue to aqua blue of shallow water. We arrived Mengalum! 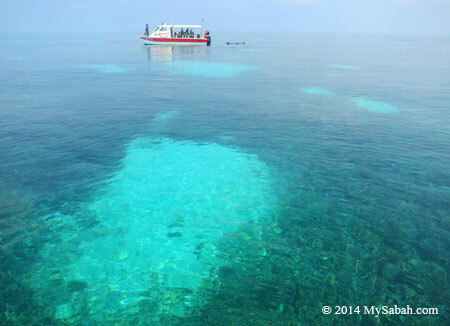 Everyone got excited when they saw a sea turtle swam by our boat and the thriving corals in the sea. I got off the boat and looked around. My first impression of Mengalum is – it’s a deserted island (actually there is a resort at another side) with long stretch of beach. The island is flat (without high ground), with dense patches of trees fringing a few edges of the island. There are monkey living in the wood. 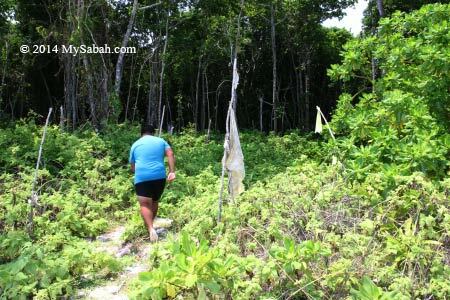 I wonder how these monkey reached this island 56 KM away from mainland. 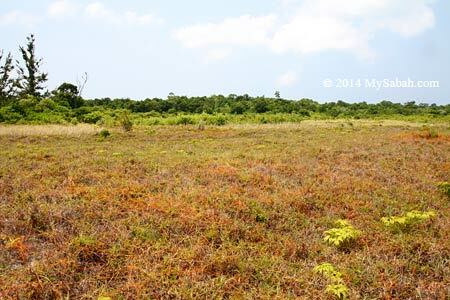 The centre is a wide grassland dotted with seaside shrubs (e.g. Scaevola sp.). Nearly 232 acres of this island is a protected bird sanctuary for migratory birds. Anyway, I spotted no bird and monkey in my trip. 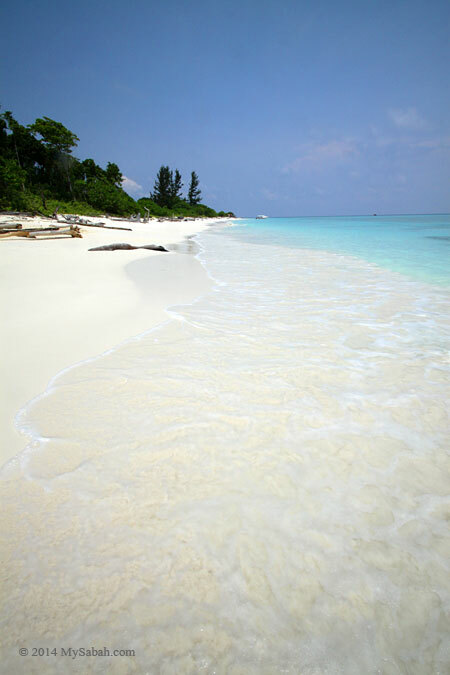 The sand on Mengalum is the whitest and finest, it is as powdery as flour, unlike the coarse sand more commonly found on other islands. 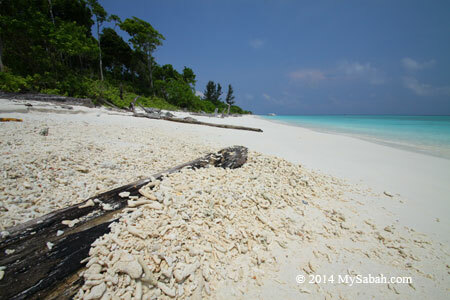 There was no other people around, so it was like our private beach with only our footprints. For such a picture perfect scenery, every couple, family, group of friends became busy doing selfie and usselfie. You know I’m not lying when you see those happy faces in my photos. 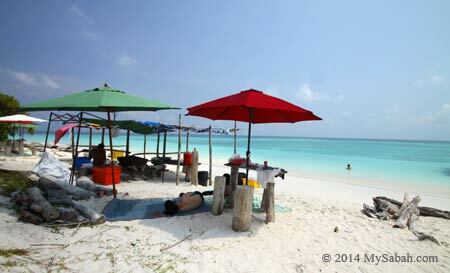 While we were admiring the sea view, our travel agent had setup the parasols and beach mat for us. Some of us went swimming in the blue sea and children frolicked on the beach and picked up a few starfishes. 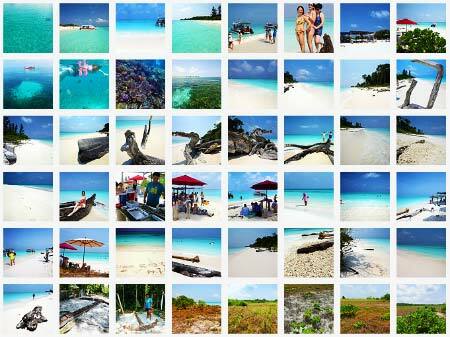 Mengalum Island is 4 Sq. KM in size (<1,000 acres) and you need about 1 hour to walk one round. 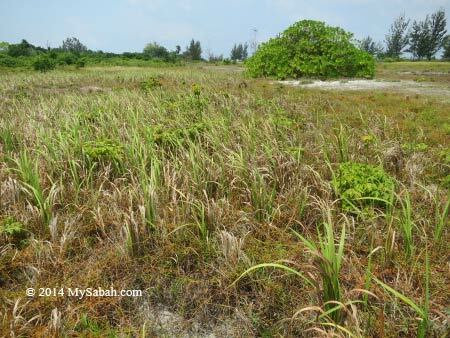 In 2011, the owner wanted to sell his resort and 250 acres of land of this island for US$18,000,000 (RM 60 Millions), but it didn’t happen. FYI, there are some sandflies in shaded area of the beach, but not to an unbearable amount. It’s a tiny blood-sucking insect with white wing and black body. Its bite is not painful but will turn itchy next day (don’t scratch or it’ll become worse). To avoid bite, just cover your exposed skin with towel or beachwear, or another better option is to wear full body swimming suit. We started our first snorkeling session at 10:30am and our boat dropped us to a coral area (we saw two turtles again from the boat) a few hundreds Meters off the shore. 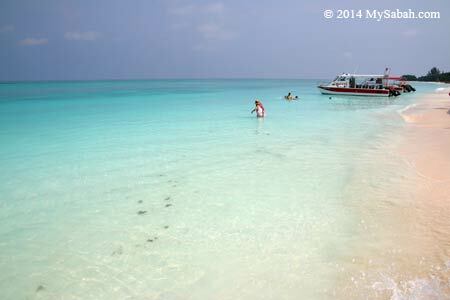 We put on our life vest, snorkel and mask (no fin provided), and entered the crystal clear water. 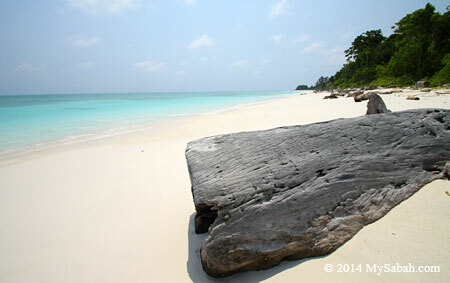 During high tide, the water is about 2 to 5 Meters deep, and the visibility is superb. 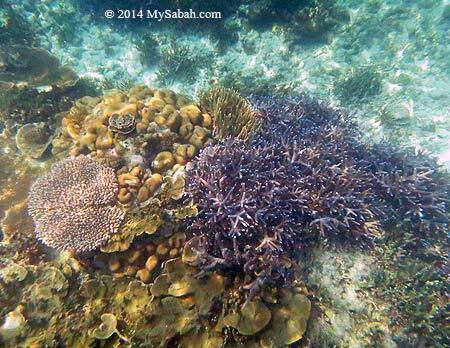 By looking at the flourishing corals, the nursery and shelter of marine lives, I know why anglers say Mengalum is abundant in groupers, snappers, mackerels and other reef fishes. 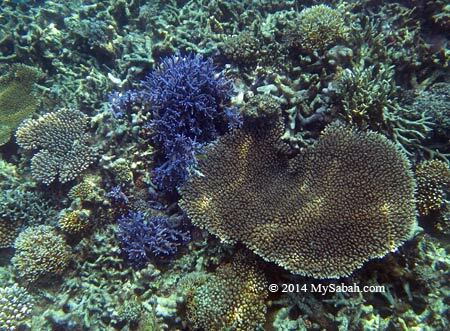 Most of the corals I saw were hard corals, for example, staghorn corals, lettuce coral, table corals. Many grow really big, intact and in good condition, with clownfishes, cleaner fishes and butterfly fishes swimming among them. I believe Mengalum is also an excellent scuba diving site. 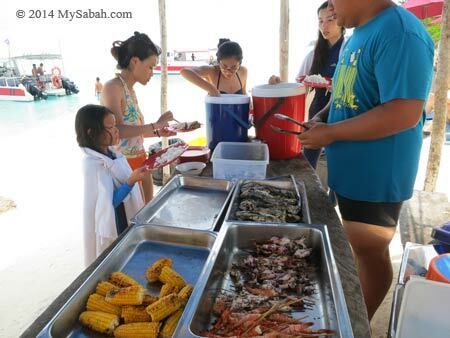 When we were back on shore, a delicious BBQ lunch buffet was waiting for us. We had barbecue fishes, corn, squid and curry chicken, and free flow of soft drink (100plus, Coke). It was really a hot sunny day, so we sat in the shade of parasol, enjoying the nice food and ocean view. 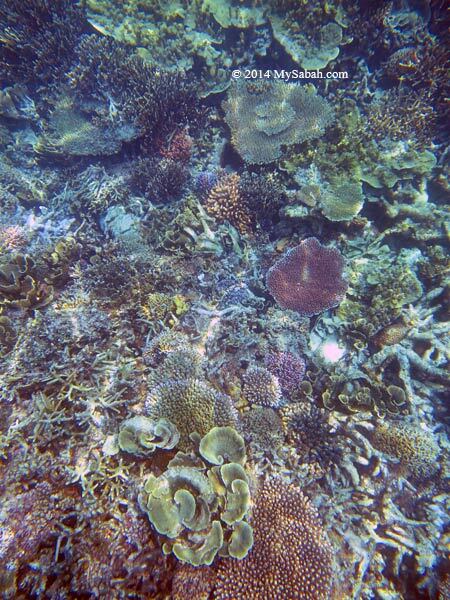 After some rest, the guide called us for second snorkeling session. Some felt sleepy after heavy meal and preferred to take a nap on the beach. Before I came, many already told me about the magical anchor located in the south-west corner of Mengalum. 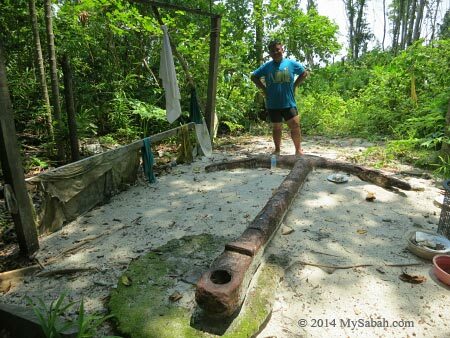 Some says it’s an anchor left by one of the fleet’s vessels of famed voyager Ferdinand Magellan, while another legend says it’s from a wrecked native fishing boat but grows bigger and bigger over time. The local fishermen believe this metal anchor endowed with special supernatural power. If it’s removed, the island will sink. 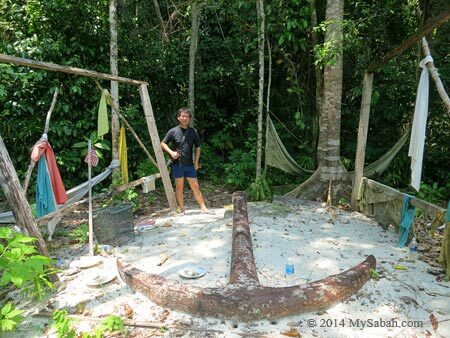 Ah Lam, my guide said this anchor was only a 10-minute walk away from our beach, so we decided to check out this relic. We walked along the sandy beach until we reached a few faded yellow flag markers in the grass near the shoreline, then followed the small path into the forest. After 20 Meters, the Mengalum Anchor Shrine was just right in front of us. The anchor is so huge, a lot bigger than I think, probably longer than 2 Meters. Seem like someone built a makeshift altar to worship the anchor. Ah Lam says it’s used to have a roof. I searched for wording on the anchor, trying to find the clue that told me its identity but its surface is rusted. 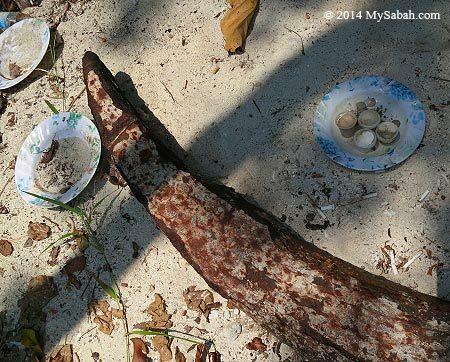 There were some offering such as betel nuts and coins laying around the anchor. 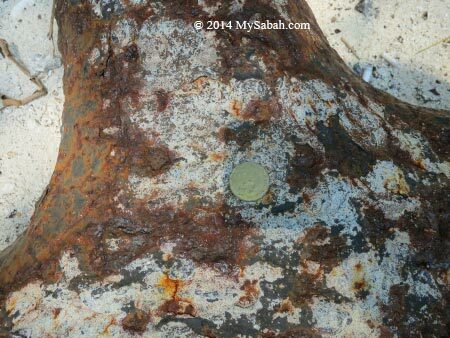 Based on this piece of info, this 160-year-old anchor is definitely not from Ferdinand Magellan, because his expedition fleet passed by Borneo in 1521. Its origin is still an unsolved mystery then. 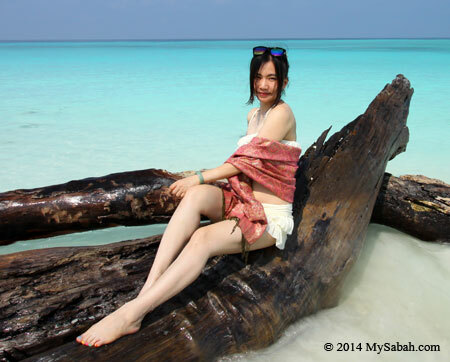 During beachcombing, I found many big and small drift wood washed to shore by waves. Some have very cool shapes and look like sculptures. 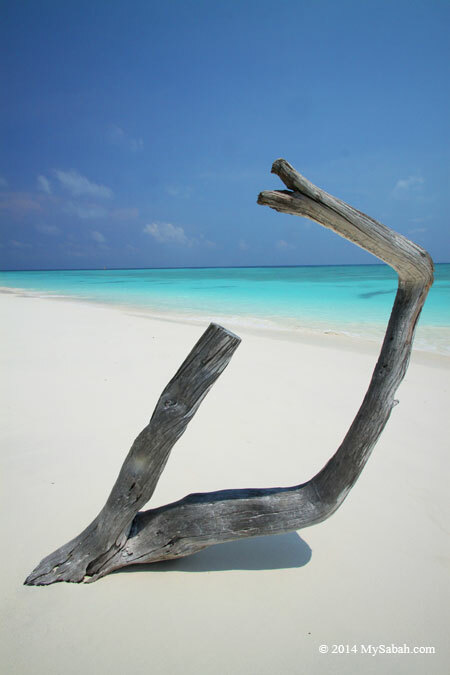 According to Ah Lam, that’s why many couples also come to Mengalum Island for wedding shots due to the beautiful beach and interesting log. I’m kind of agree with him and wish to collect some wood, as they are great decorative item for my fish tank, but I don’t want to anger the Anchor God haha.. so I took nothing but photographs. We left Mengalum at 2:30pm but some may have left their hearts behind. It’s a wonderful experience. 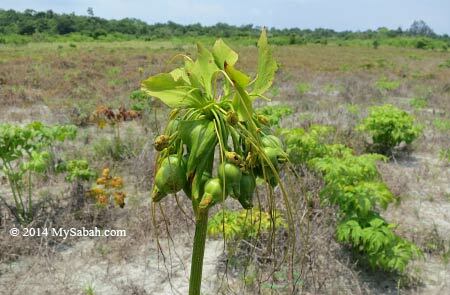 If you want to visit Mengalum Island, you may book the tour with WB Tours and Travel or other licensed travel agents. The listed price for day trip is RM300 (≈US$93) (negotiable). 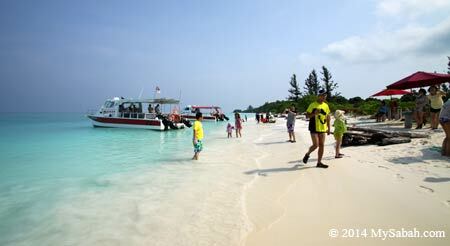 The fee includes return hotel transfer, boat transfer, lunch, snorkeling set and terminal fee. 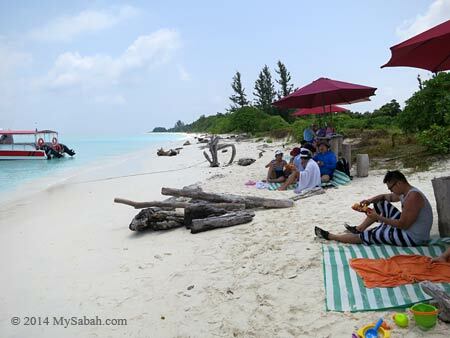 But please note that it’s a basic picnic style and there is no jetty, toilet and changing room in the trip (you can use the toilet in the boat). If you want access to better amenities, you may consider overnight tour with Mengalum Island Resort, which has 13 rooms and able to accommodate 60 people. 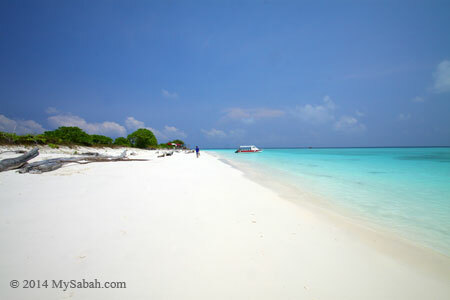 A 2-day-1-night trip will cost RM750 (≈US$227) per head (available via Summer Cruise Holiday), which is less competitive if compared with other nearby islands such as Mantanani Island and Pulau Tiga Island. Hope this island will open new mid-range and budget lodges. 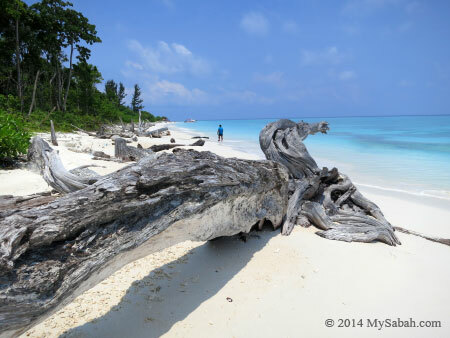 It can become the next hottest island destination. 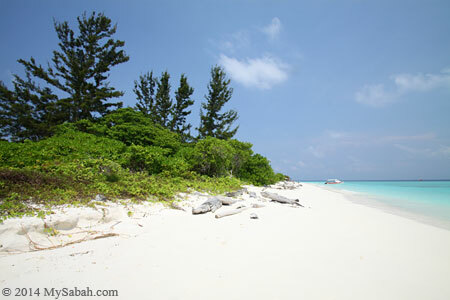 Tip: For the best experience, you should visit the island during good weather. You may check the marine forecast prior to booking.